When I was pregnant with my child, I remember reading that the medical profession had taken a very natural process, and made it more complicated by expecting us to lie on our backs to give birth. Now I’m reading that technology has altered the way we, um… well, you know and that the invention of the toilet changed our natural “elimination position” from squatting to sitting, and that’s just a very bad thing. Check out Squatty Potty, meant to slide under, and to both sides of your existing toilet seat, this little stool-type gadget allows you to assume a more, shall we say, natural position, when using the toilet. So if you suffer from any potty problems, like constipation, hemorrhoids, colon, or even urinary issues and pelvic floor concerns, the Squatty Potty may be for you. 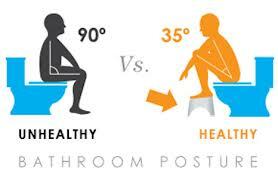 There seems to be some compelling evidence that the “western toilet” has given way to a whole myriad of toileting issues, and that the Squatty Potty can more properly align you and provide you with a much more comfortable, quick and complete elimination experience that you need in order to maintain a happy healthy body. As if one can’t use a few old books and have to shell out money to get a plastic tool. I wonder who comes up with these inventions. Don’t tell me that you have actually bought this.